Deep learning is this amazing subfield of machine learning that has exploded in recent years. Many deep learning models have been arounds for over two decades, but it wasn’t until the last few years that they started becoming popularized. A deep learning model requires two things: 1. a ton of data, 100s of megabytes, if not gigabytes of data (as a minimum) and 2. high computational power. It was discovered around 2009 that graphics cards (GPUs) can be used to supercharge deep learning. Standard computers have a few cores, maybe a dozen on a higher end machine. GPUs have thousands of cores, whereby computations can be parallelized increasing computing time by orders of magnitude. If you’re serious about deep learning, or building an AI startup, it might be a good idea to build your own rig. Amazon charges you an arm and a leg, and their hardware is obsolete. In this post I’m going to outline how to build a computer dedicated to deep learning, while keeping the price tag below $5,000. The first thing we’re going to need are some GPUs. 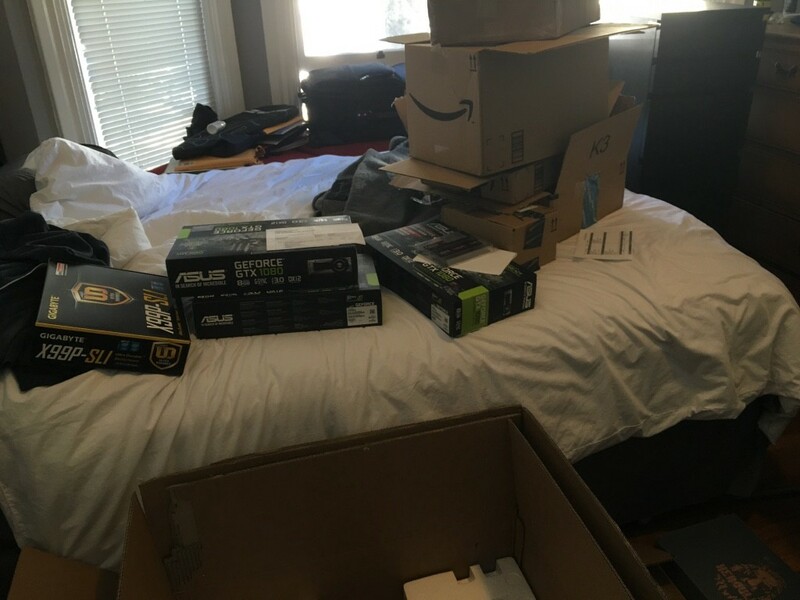 We chose to get 4 Asus GTX 1080s. The new GTX Titan Xs were only recently announced, and have an increased price tag. We purchased the Asus GTX 1080 Founders Edition. If we could do it again, we would not get the founders edition, simply because of the increased cost. 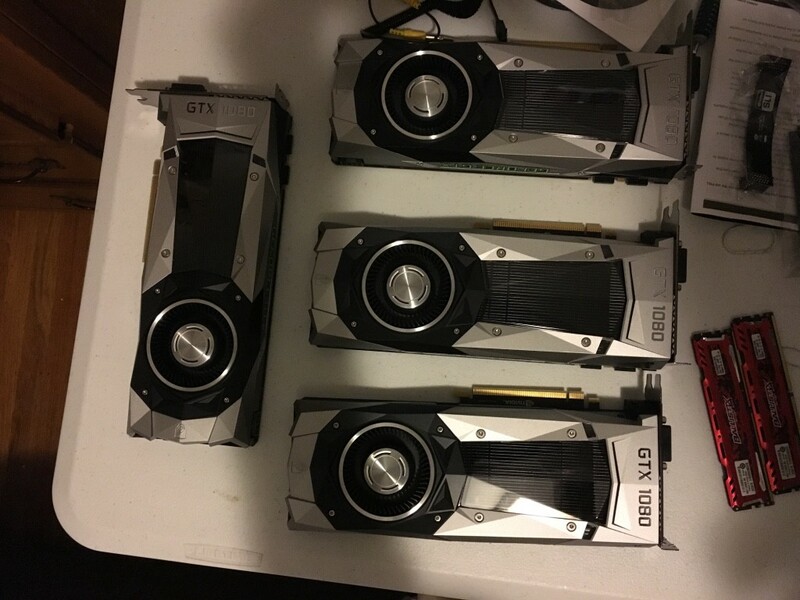 Each GPU cost around $740 (on average). Finding them proves to be difficult. Online marketplaces like Amazon consistently run out. We ended up purchasing 1 from Amazon, 1 from B&H, and 2 from eBay. Depending on your needs you can probably get away with the GTX 1070s, but we felt the 1080s had the best bang for the buck. For the motherboard, you’re going to need to find one that has 4 PCI 3.0 slots. There aren’t many motherboards with this option, so it’s slim pickings. We settled for the Gigabyte x99p-SLI. It cost $284. For RAM, we decided to get 4–16GB Ballistix DDR4 and 2–8GB Ballist DDR = 80GB of total RAM. The motherboard supports up to 8 sticks of RAM, so if you feel inclined to, MAX it out. The additional 8GB sticks were only purchased to save some money and get a little more memory. For the CPU we chose Intel’s 5930k i7, a 6 core processor (12 virtual cores). We originally made the mistake of purchasing the 6700k i7, but found it was incompatible with our motherboard. And then we tried the 5820k, but realized it only supports 3 PCI slots. Finally we bought the 5930k i7 and we were off to the races. I would suggest using PC Part Picker to ensure everything is compatible before purchasing your hardware. Don’t make the same mistakes we did — it ended up costing us more and a few trips to Fry’s Electronics. In order to power the RIG, you’ll need a lot of watts/amps. We purchased the Hercules 1600W power supply. 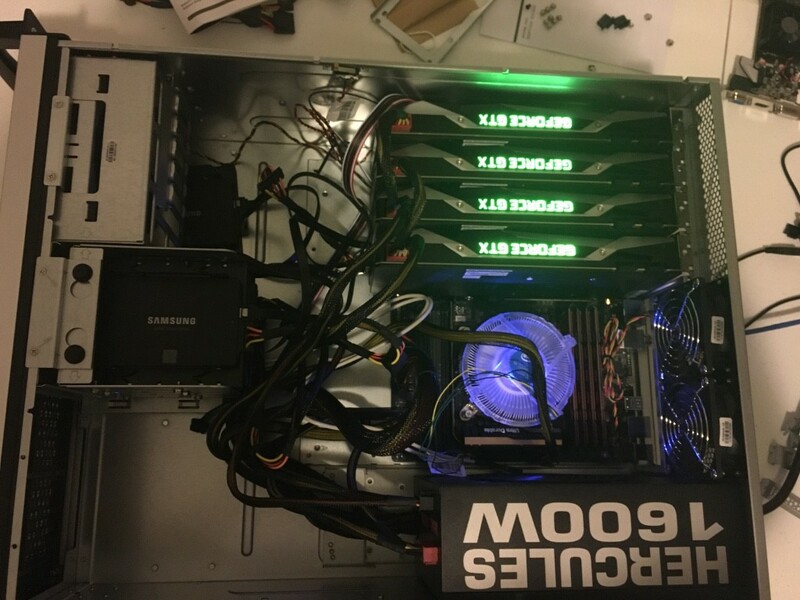 While expensive, the extra power ensures we can get all the performance out of the GPUs. The packaging also looks cool. For storage we purchased 5–500GB Samsung 850 EVO solid state hard drives. We decided on getting a few hard drives because we wanted to create virtual machines (VM) for each GPU and have the data allocated to each VM; saving the 5th hard drive for the host. If you’re building a custom rig, I would recommend just purchasing a 1TB SSD or possibly a 2TB if you have the cash. If you plan on putting your machine inside a server rack, I would recommend purchasing the CHENBRO RM41300-FS81. 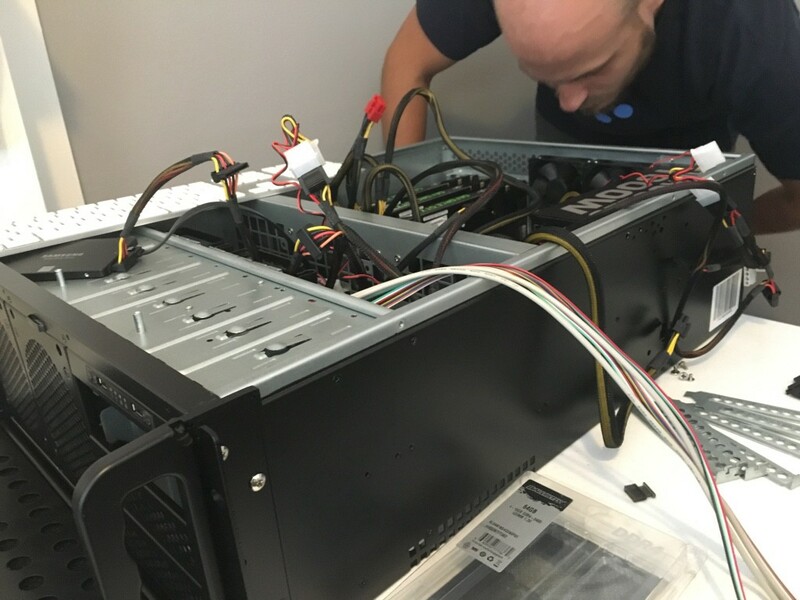 We originally used a different 4 unit server chassis and realize that it didn’t have 8 expansions slots (2 for each GPU). In fact the CHENBRO is the only reasonably priced server chassis with 8 expansion slots. Like and share if you find this helpful! Curious about Deep Learning, NLP, AI. Hopeful traveler, wannabe chef.